Walla or wala is a person who is involved in a specific activity or task. It is derived from Hindustani वाला - vālā. A wallah of anything is an occupation which is generally held by those with a lower status in society. Dhobi wallah - laundry worker. 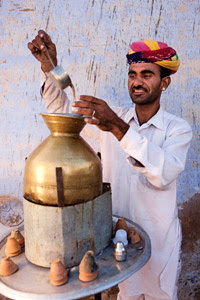 Therefore a Chai wallah is a street vendor selling chai - selling tea that is distinctively Indian in flavor. Chai wallahs knows no gender or age group but usually the task is performed by men or old women. Chai wallahs do not just sell tea but they prepare the tea themselves to sell. They are a major human landmarks in Indian society. They usually have stalls or carts that they work from and sometimes have an errand boy/person to make the tea runs. These tea runners carry the cups of tea on trays that have notches or cup holders built in. A Chai wallah's tea stall is a gathering place for the local community. Mostly men patronize these stalls, and they come from all stratas of society. It is the local gossip ground and catch-up for many. Each Chai wallah have their own recipe and method of preparation. No two are the same as also with their patrons each have their favorite Chai wallah.